Dennis joins CFO Selections as an enthusiastic and effective senior finance professional with experience in a variety of industries and company stages, ranging from start-up to well-established. He has over 30 years of experience in finance, accounting, operations, planning and analysis, new ventures, and mergers and acquisitions. Thriving in dynamic and unstructured environments, he enjoys bringing “order to chaos”, and describes himself as a visionary who likes to help others succeed. 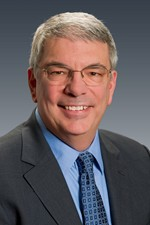 Most recently, Dennis established the local office of a national consulting firm, where he helped clients acquire small and medium-size companies. Dennis spent 14 years at Continental Mills, where he held various titles including Director of Finance. While there, he managed all facets of finance, accounting, product costing, and financial planning and analysis. He created state-of-the-art financial reporting and analysis, implemented company-wide Activity Based Costing (ABC) methodologies, orchestrated several acquisitions, and co-managed a manufacturing plant. 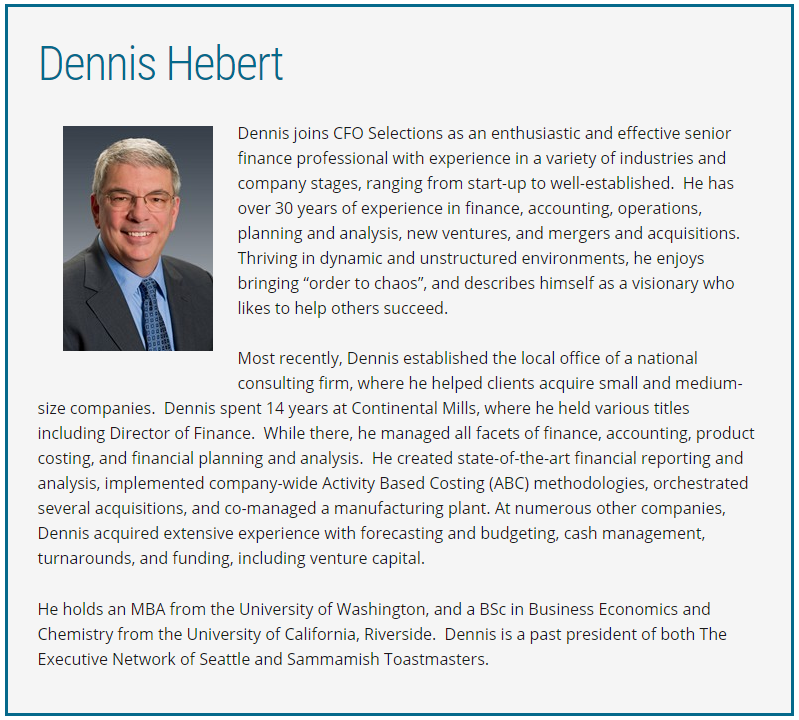 At numerous other companies, Dennis acquired extensive experience with forecasting and budgeting, cash management, turnarounds, and funding, including venture capital. He holds an MBA from the University of Washington, and a BSc in Business Economics and Chemistry from the University of California, Riverside. Dennis is a past president of both The Executive Network of Seattle and Sammamish Toastmasters.